Bollywood actor Ajay Devgn has shared the teaser poster of wife Kajal's upcoming film 'Helicopter Eela' Revealed the teaser poster and announced the title of his wife, Kajol’s upcoming film, Helicopter Eela on his social media handles. Riddhi Sen, who won his first National Award for Nagar Kirtan, plays the onscreen son of Kajol's character in the movie, which is said to explore the different shades of a mother's relationship with her son. Eela will mark Kajol's first film after she made a comeback to Tamil movies with last year's VIP 2, in which she co-starred with Dhanush.Her last Hindi film was 2015's Dilwale, directed by Rohit Shetty, opposite Shah Rukh Khan. The ‘Golmaal Again' star, who is producing the film, took to social media to share the poster, writing, “She's here, there, everywhere!!! #HelicopterEela is coming on 14th September. @KajolAtUN @riddhisen896 @pradeepsrkar @HelicopterEela @ADFfilms @PenMovies @jayantilalgada” Directed by Pradeep Sarkar, the film features the ‘Dilwale' star as a single mother who aspires to be a singer. 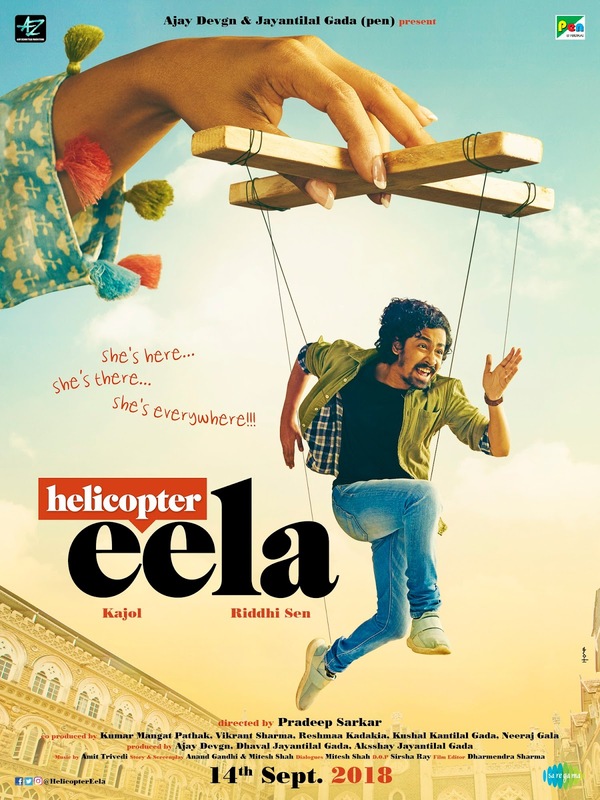 Kajol also tweeted the new poster of Helicopter Eela, described the protagonist as "Yahaan, wahaan, sab jagah... aa rahi hai Helicopter Eela." It won't be long for Kajol fans to see her again on the big screen. Her next film, tentatively titled Eela, is due to be released in theatres on 14 September. The actress is set to play a single mother in the film written by Anand Gandhi and directed by Pradeep Sarkar. Gandhi has based the film on his Gujarati play, Beta Kaagdo. #NewsAlert: Kajol starrer tentatively titled #Eela... Co-stars Riddhi Sen as Kajol’s son... Directed by Pradeep Sarkar... Produced by Ajay Devgn and Jayantilal Gada [PEN]... 14 Sept 2018 release. Helicopter Eela budget 13 -14 Crore.